A reflection can be thought of as folding or "flipping" an object over the line of reflection. 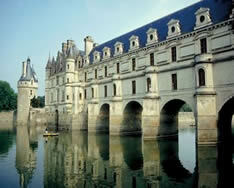 • The original object is called the pre-image, and the reflection is called the image. • An object and its reflection have the same shape and size, but the figures face in opposite directions. The objects appear as if they are mirror reflections, with right and left reversed. 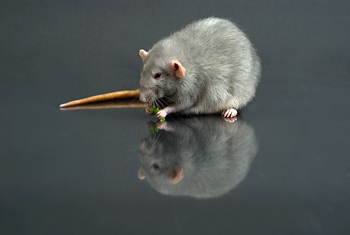 A reflection can be seen, for example, in water, a mirror, or in a shiny surface. Take a look at the following reflections. 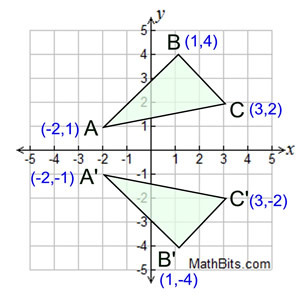 When you reflect a point across the x-axis, the x-coordinate remains the same, but the y-coordinate is transformed into its opposite (its sign is changed). 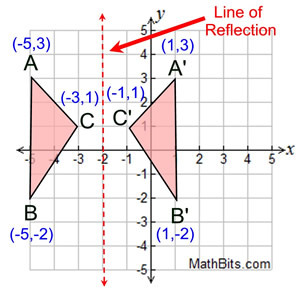 If you forget the rules for reflections when graphing, simply fold your paper along the x-axis (the line of reflection) to see where the new figure will be located. 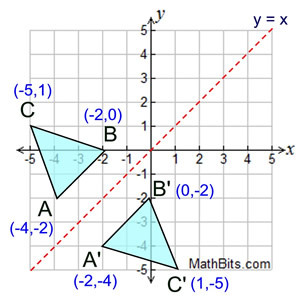 Or you can measure how far your points are away from the x-axis to locate the new points, such as B is 4 vertical units above the x-axis, so B' will be 4 vertical units below the x-axis. the x-axis is the point (x,-y). When you reflect a point across the y-axis, the y-coordinate remains the same, but the x-coordinate is transformed into its opposite (its sign is changed). 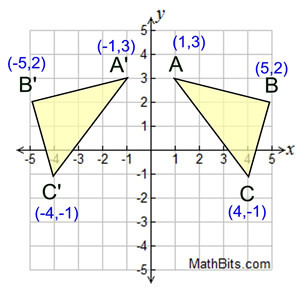 Notice that B is 5 horizontal units to the right of the y-axis, and B' is 5 horizontal units to the left of the y-axis. the y-axis is the point (-x,y). When you reflect a point across the line y = x, the x-coordinate and y-coordinate change places. If you reflect over the line y = -x, the x-coordinate and y-coordinate change places and are negated (the signs are changed). the line y = x is the point (y, x). the line y = -x is the point (-y, -x). 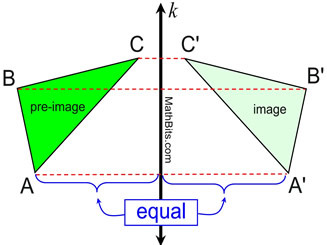 Remember that each point of a reflected image is the same distance from the line of reflection as the corresponding point of the original figure. The line of reflection will lie directly in the middle between the original figure and its image. Notice that each point of the original figure and its image are the same distance away from the line of reflection. You may be able to simply "count" these distances on the grid. 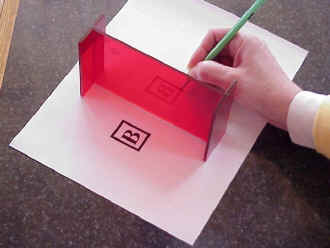 A small plastic device, called a Mira™ , can be used when working with line reflections. The Mira is placed on the line of reflection and the original object is reflected in the plastic. By looking through the plastic, you can see what the reflection will look like on the other side and you can trace it with your pencil. 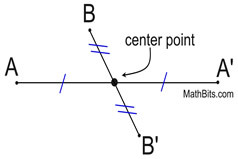 A point reflection exists when a figure is built around a single point called the center of the figure, or point of reflection. For every point in the figure, there is another point found directly opposite it on the other side of the center such that the point of reflection becomes the midpoint of the segment joining the point with its image. Under a point reflection, figures do not change size or shape. 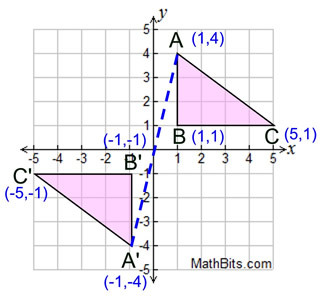 While any point in the coordinate plane may be used as a point of reflection, the most commonly used point is the origin. Assume that the origin is the point of reflection unless told otherwise. Triangle A'B'C' is the image of triangle ABC after a point reflection in the origin. Imagine a straight line connecting A to A' where the origin is the midpoint of the segment. When you reflect a point in the origin, both the x-coordinate and the y-coordinate are negated (their signs are changed). In a point reflection in the origin, the image of the point (x,y) is the point (-x,-y).